Two and a half years ago, Adamstown, MD residents Lauren and Sean Shillinger gave birth to a beautiful little girl named Brynleigh. Brynleigh was their first child, and Lauren experienced a full-term pregnancy and a normal delivery. But when Brynleigh was just 9 1/2 months old, Lauren and Sean started to notice something unusual in Brynleigh’s behavior. Brynleigh began to make strange eye movements, stared intensely, often raised her arms involuntarily, and even experienced what appeared to be seizures. Lauren rushed to schedule doctor appointments for Brynleigh to determine what was going on, but clinicians assured her that nothing was wrong and suggested that Lauren and Sean were just anxious about being first-time parents. Not quite convinced, Lauren began to film Brynleigh’s behavior, pulling out her smartphone each time her daughter made unusual movements with her eyes and arms. It was that footage and her motherly intuition that led her to take Brynleigh to Children’s National Health System for another opinion. “Our pediatrician told us that Children’s National was the top facility and that he could help make the call to get us in for a urgent blood test to start the process,” said Lauren. After showing the footage to Children’s National neurologists, Brynleigh was admitted in the fall of 2014 for an extended electroencephalogram (EEG). 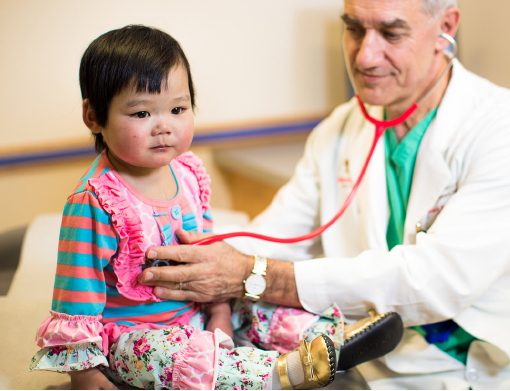 After ordering the EEG, a test used to detect abnormalities in the brain’s electrical activity, her pediatrician called Children’s National to discuss initial results with Dewi Depositario-Cabacar, MD. “Together they decided it was best for Brynleigh to be admitted to the hospital right away so that additional testing could be performed. The nurses were warm and welcoming and comforted us during a very scary time.” said Lauren. Doctors discovered that Brynleigh suffered from epilepsy triggered by a disorder called tuberous sclerosis complex (TSC), a rare multisystem genetic disorder that causes benign tumors to grow in the brain, kidneys, heart, eyes, lungs, and skin. For patients with TSC, effects can vary. Some patients experience mild or no symptoms and live full, productive lives, while others may experience regular tumors in various organs. Brynleigh’s EEG unfortunately revealed three or four tumors in her brain and two or three tumors in her heart. Overwhelmed by the news, Brynleigh’s parents and her doctors initiated anti-seizure medications and enrolled her in speech therapy to continue her development. As the Shillinger family coped with disorienting changes in Brynleigh’s health, Lauren was left with one lasting memory: how the nursing staff calmed their fears with patience, compassion, and kindness. “All of the nurses and physicians we encountered were kind, compassionate, and truly caring. Dr. Depositario-Cabacar made sure to spend extra time with us as we got our diagnosis and answered all of our questions in detail,” said Lauren. “They helped to ease our fears and concerns for our precious daughter.” The nursing staff was a constant presence for the Shillingers, ensuring that Lauren and Brynleigh had everything they needed to continue breastfeeding and quickly managed Brynleigh’s allergic reactions. have since become strong advocates for the disease, lobbying for more tubular sclerosis research and learning as much as they can about the disease from the Tuberous Sclerosis Alliance in Silver Spring, MD. This month, the Shillingers will join a national walk for tuberous sclerosis awareness and hopes to connect with other families who may experience it as well.